NASA Designs a One-Man electric Puffin. On the ground, the Puffin is designed to stand on its tail, which splits into four legs to help serve as landing gear. 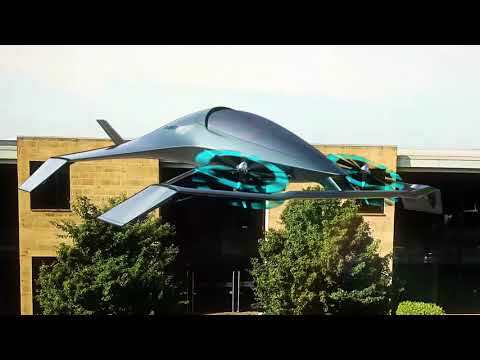 Conceptual design focusing on the ability of a redundant electric propulsion system to provide new capabilities for Vertical Takeoff and Landing aircraft. "Is it possible for a one-person electric plane to take off vertically and fly 300 mph? NASA says yes, and shows us how it's done with Puffin, a single-passenger aircraft that's 10 times quieter than the most hushed helicopters. The design, accomplishing the same goal as a jetpack with a cockpit, could be the closest man has ever come to flying like a bird. Using today's technology, Puffin can cruise for 50 miles, but aerospace engineers at NASA say that range could triple by 2017." [ Note: ] The video has no audio.